Dr. Bara Alsalaheen (center) and his research team. Dr. Bara Alsalaheen is an assistant professor of physical therapy at University of Michigan-Flint. Dr. Alsalaheen is also a research assistant professor in the Department of Neurology at University of Michigan-Ann Arbor and a Physical Therapist at Michigan NeuroSport at Michigan Medicine. He has conducted numerous research projects related to concussions and concussion prevention. 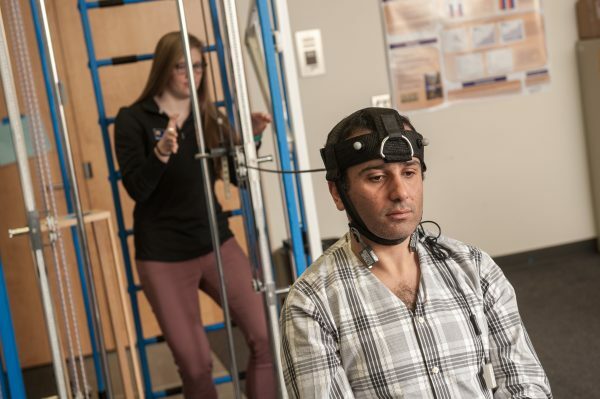 Dr. Alsalaheen discusses his latest concussion research, the contributions and benefits of UM-Flint students to faculty research on campus, the collaborative benefits of being part of the University of Michigan system, and more in this interview with University Relations. Can you describe the current concussion research you are conducting at UM-Flint? The current research I am conducting at UM-Flint is looking to examine if the neck response after a hit has the potential to play a protective role in reducing the risks for concussion. For instance, we believe that if neck muscles respond quicker after impact, they may reduce head acceleration and velocity after impact and potentially reduce the risks of concussion. We are also examining if muscle size and strength also play a role reducing head impact. We conduct this research in the lab by inducing head impact delivered through a small and safe amount of external weight. What are the potential benefits of this research for concussion prevention? At the end of the study, we will be able to find out the factors that are more effective in reducing head acceleration after impact. This information can then be used to develop possible treatment programs for athletes. For instance, if the quickness of the neuromuscular response is found to be important for controlling impact, training programs can aim to improve quickness rather than increasing muscle size or strength. How are UM-Flint students contributing to this research? What academic and skills backgrounds are these students? UM-Flint students are essential to the success of this research project and other projects that I conducted since my arrival at UM-Flint. For this particular project, students are contributing to the success of this project by being immersed in all tasks related to the project. UM-Flint students assisted in developing the device we use to deliver impact, developing the impact protocol, recruitment of research participants on campus, testing participants, processing motion capture and electromyography data, performing data audit and data entry into statistical software, and performing statistical analysis. The skills of the students participating in this project are vast and diverse. Students working on this project have extensive experiences that makes them ideal to be part of a dynamic team. In this project, we have students with backgrounds in biomedical engineering, physical therapy, kinesiology, exercise sciences and business. 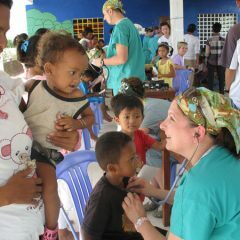 Dr. Alsalaheen and UM-Flint student Kelly McCloskey during the piloting phase of the project. How does the research environment at UM-Flint contribute to your goals as an educator? How does it contribute to your goals as a researcher? What opportunities do you see for the campus for further advancing research at UM-Flint? As an educator, we constantly emphasize that medicine and healthcare is complex and what we know now may be different from what we will know in five years. Therefore, preparing leaders and best is not about loading them with knowledge, but rather providing them with the skills needed to embrace uncertainty and strive to advance our knowledge forward. This message is much more effective when our students see us practice what we preach by constantly researching and questioning the current knowledge. For students working in research, we emphasize that we are learning together by doing research. As a researcher, the environment at UM-Flint allows me to advance my research goals by providing the resources needed to complete my research. These resources include human capital (our students), research space, and research funds at the department, school and campus level. I also get a chance to collaborate with other faculty members on research projects. 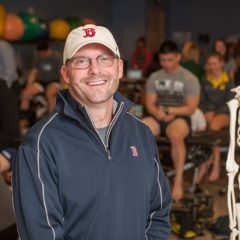 For instance, this project is conducted in collaboration with Dr. Ryan Bean, a clinical assistant professor of physical therapy at the university. There is always an opportunity to advance our research. Some of these opportunities include developing research alliances with other institutions and the community. A research alliance will leverage all resources and increase the positive impact of our research enterprise on the communities. Another opportunity is to foster a sustainable research climate on our campus. A sustainable climate ensures that our faculty have research programs rather than research projects. Established research programs can attract high quality students who intentionally seek these experiences as part of their education, and established programs have greater impact on the community. You also work on the Ann Arbor campus and conduct research there as well. How does being part of the university system benefit faculty and students in research and other professional ventures? That is correct. Being part of the U-M system benefit me as a faculty by allowing me to leverage the unparalleled resources available at U-M. I hold an appointment in the medical school and collaborate on concussion related research with colleagues from the departments of Neurology, Physical medicine & Rehabilitation, Statistics and from the School of Kinesiology. Additionally, I treat concussion patients on a regular basis every week, allowing me the opportunity to use my research and training to improve patient’s recovery. Being part of the U-M system also improve the student’s learning by providing them with diverse experiences. 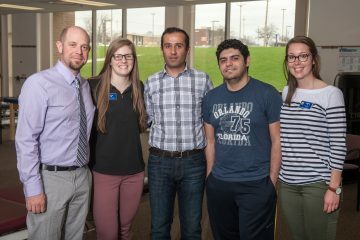 Some of our PhD in Physical Therapy students conduct their PhD work at Michigan Medicine, and many of our Doctor of Physical Therapy (DPT) students complete their clinical rotations at Michigan Medicine. 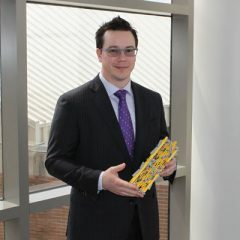 One of the qualities that makes UM-Flint special is the ability of students to work closely with faculty on projects. How is this beneficial for students? The ability of our students to work closely with faculty on research projects is invaluable to our students’ learning and professional development. Students working in my laboratory usually work in teams and have to coordinate multiple schedules, delegate tasks and meet weekly research targets. I believe that providing an accountable, yet a safe environment is key in fostering leadership skills among our students. In a traditional classroom environment, the students learn about research methods and statistics, but often times it is hard to internalize just by learning about in the classroom. When a student works on my team as a research assistant, I make sure that he/she participates in all research activities such as research design, data collection and analysis, and research dissemination in publications and presentations. Students in my laboratory regularly publish in peer reviewed journals, and present their work on national conferences. Over the past three years, seven different students were co-authors on 10 peer-reviewed published manuscripts. Some of whom graduated from our program with 5 peer reviewed publications. I have had former students who worked in my laboratory express their gratitude that their research experiences positioned them a head of other job applicants. The biggest gratification comes when I learn that former students are using research skills gained here to study and improve patient’s outcomes in their new environments. It is these experiences that assures me that we truly prepared “leaders and best”.